Come and get your love. 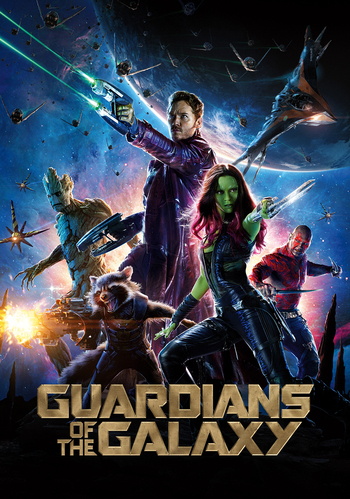 note (from left to right): Groot, Rocket Raccoon, Peter "Star-Lord" Quill, Gamora, and Drax the Destroyer. Peter: 'Cause I'm one of the idiots who lives in it! Guardians of the Galaxy is the 2014 movie adaptation of the Guardians of the Galaxy comic series and the tenth film in the Marvel Cinematic Universe. It was directed by James Gunn of Slither and Super fame. Far off, in the depths of the Milky Way, the expansionist Kree Empire has reluctantly made peace with the planet Xandar. But one of the most vicious and powerful Kree warlords, Ronan the Accuser, still has vengeance on his mind. He goes behind his government's back and strikes a pact with one of the most dreaded beings in the galaxy, Thanos the Mad Titan. In exchange for a certain ancient relic, the Mad Titan will grant Ronan's one wish: genocide. However, the relic has already been looted from its hiding place by Peter Quill (Chris Pratt), a.k.a. "Star-Lord", an outlaw and thief abducted from Earth as a child. This Earthling knows nothing of the relic's nature — he's been raised by Space Pirates and simply wants to sell the artifact off. He goes behind the back of the pirate chief Yondu and takes the relic to Xandar, where he's set upon by the bounty hunters Rocket Raccoon (Bradley Cooper) and Groot (Vin Diesel) and Thanos's pet assassin Gamora (Zoe Saldana). After this Ragtag Band of Misfits ends up flung into a maximum security prison with Drax the Destroyer (Dave Bautista), their mutual self-interest pits them against the Nova Corps, the Ravagers, and Ronan's relentless pursuit... and unexpectedly turns them into saviors. Karen Gillan and Lee Pace portray the film's villains, Nebula and Ronan the Accuser respectively; Glenn Close portrays Nova Prime Rael, the head of the Nova Corps; John C. Reilly plays Nova officer Rhomann Dey; Benicio Del Toro portrays The Collector; Djimon Hounsou plays Korath, Michael Rooker plays Yondu and Ophelia Lovibond portrays the Collector's assistant. A sequel, Guardians of the Galaxy Vol. 2, was released in May 2017 set a few months after the events of the first movie. The Guardians of the Galaxy also appeared in Avengers: Infinity War in 2018, and are due to appear in Avengers: Endgame in 2019. Guardians of the Galaxy Vol. 3 will be made at a later point in time. "So, what should we do next? Something good? Something bad? A bit of both?" Agents of S.H.I.E.L.D. S1 E22 "Beginning of the End"